I have been hunting down this mouse ever since I stumbled across their website several months ago. My interest was peaked by the totally different design the implemented for the profile changing and in the inclusion of a Cherry MX blue mechanical switch. It will come as no surprise that the Leetgion brand has appeared out of the blue like so many new entrances into the gaming peripheral market. Leetgion is not a complete unknown tho, they originated from Thermalright in 2010. Thermalright has a well-deserved reputation for making high-quality cooling solutions for the PC enthusiast market. The hellion mouse is primarily targeted to RTS games, especially Starcraft 2. As you can see from the picture throughout this review most of the features are based around optimal performance for RTS players. I had to keep reminding myself about this throughout, this mouse is very much surgeon's scalpel and not a sledgehammer. If you are an RTS player looking for the right tool for the job then this mouse should be on your list to check out. The first thing that strikes me about the Hellion is the rather odd but bland appearance of it. The DPI buttons are on the back of the mouse, which might seem like the wrong place to put it on a mouse. But as this mouse is targeting RTS players itâ€™s actually one of the best places to put it. As an RTS player, you're probably never going to change the DPI in the middle of a game. The placement makes it almost impossible to bump either button. The Profile switcher is located on the bottom of the mouse and is large and easy to access wheel, also referred to as the "Race" selector. The profiles are labelled very well and rotating the profile selector will also change the backlight of the mouse. The tail backlight for each profile can be defined in the Hellion configurator, along with other options. You will also notice that profile 2, 3 and 4 are labelled as Terran, Zerg and Protoss. The Cherry MX Blue switch on the right-hand side to the mouse is something that you will either love or hate. Leetgion have dubbed this button the "Attack" button, this is due to the fact that the three predefined profiles for Starcraft 2 can use this button for Attacking. The Cherry MX switch feels totally different to any of the other mouse button. If you have a mechanical keyboard then you have a pretty good idea of how this feels. The travel on the know the button feels quite long compared to the other buttons on the mouse but is very light and smooth. If you have a claw grip you probably won't feel very comfortable. The position of the Attack button makes it a little hard to place your thumb in the right spot, also when you go to press the Attack button with your thumb you can lose your grip and the mouse will wonder. You cannot rest your thumb on the Attack button as there is no resistance to stop you pressing it all the way in. I found either a palm or finger grip to work the best. Either of these grips gave me a much more natural way of holding the mouse as well as easily reaching the Attack button without losing grip. Without the software installed the mouse works just fine. The backlighting for the default profile was red. I did find that the DPI was set to be a bit too high, but the DPI switches fixed that very quickly. The default profile setup is not bad - the Attack button on the side will launch windows explorer, while buttons 5 and 6 are the backwards and forwards for browsing. Both of these buttons are in a strange position, and it will take some time getting used to their position. The construction is very solid, there are no weak areas or strange angles. The primary buttons are extremely easy to press and register click from any location or angle. The scroll wheel is nice to use. each step in the scroll wheel feels smooth and clean, without feeling as tho you have to force the wheel to turn. The rubber coating on the scroll wheel is pretty thick and shouldn't wear out any time soon. The Hellion uses Omron switches which are some of the best. These switches are made in Japan and have an excellent reputation for durability and reliability. The packaging included an extra set of feet for the mouse, they are about a millimetre thick. I wouldn't expect the feet would need replacing for a long time. The Avago 9500 Laser sensor works very well no wonder so many manufacturers use it. I did find that the lift of distance was a bit high for my liking. As to be expected with this grade of laser sensor there is no gitter with the mouse stationary or while moving. The mouse feet glide across my surface with ease and work in harmony with the weight of the mouse. 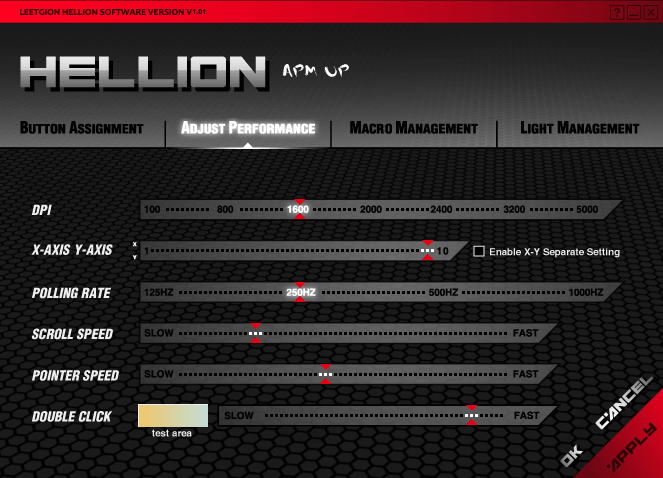 The download for the Hellion Configurator is was about 11.1MB, and the installation was very fast. There were no real decisions to make other than pressing next a few times. Once installed there is no restart required. There is currently no configuration software available (at the time of review) for Mac or Linux. This shouldn't course much of an issue if you play Starcraft 2 on a mac, as the profiles are stored in the mouse. 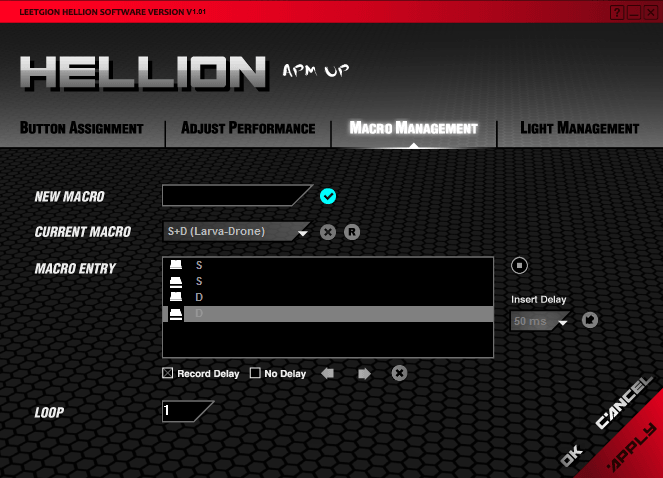 Opening up the Hellions Configurator is just like all the other configuration software, double-clicking on the small Leetion icon in the system tray. 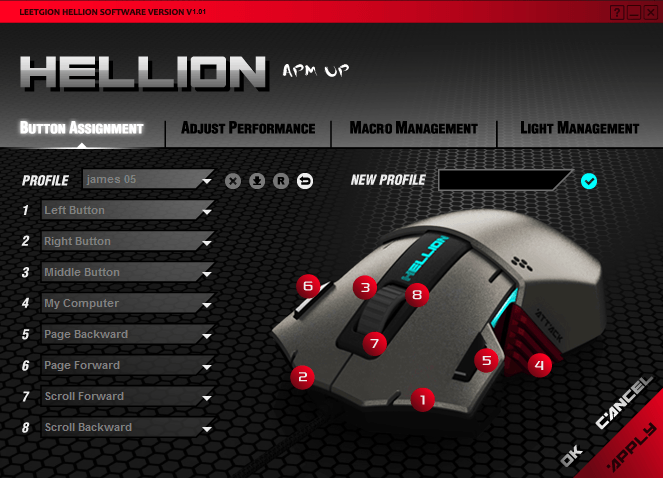 This tab allows you to assign actions to each of the 8 mouse buttons, including the mouse wheel. If you feel inclined you could set the direction of the scrolling to change your DPI up and down. It should be noted that you cannot override the default profile or the DPI buttons actions on the back of the mouse. This is probably the only thing that doesn't make sense in the overall picture. On the plus side, they do give you a custom profile to tinker with. Here we can change the DPI from 100, 800, 1600, 2000, 2400, 3200 and 5000DPI. X-axis Y-axis: You can change the interpretation of X and Y movement, you can either link them together or have a different setting for each axis. Scroll Speed: adjust the input of the scrolling of the wheel to the amount of scrolling under windows. The is where you get to tinker with and create your macros. It took me a few minutes of playing around to understand how the interface works. It's probably not as well defined as some other software out there but is easy to get to grips with. New macro - allows you to name a new macro - clicking the tick to the right adds it to the current macro below. Current Macro - select the macro to edit, delete or rename. Macro entry - shows you the key presses that make up the macro. The little Red circle to the right of the text box will allow you to record your key combinations. You will notice a bunch of checkboxes and small icons around the text box, which allows you to change delays and move or delete entries for your macro. There is a limit to how long your macro can be. Loop - define how many loops your macro should run for. Here you can change the tail lights colour for each profile. Simply select the profile and then select either a predefined colour from the list or choose to select a custom colour. I would if liked to be able to change both lighting areas, not just the tail light. 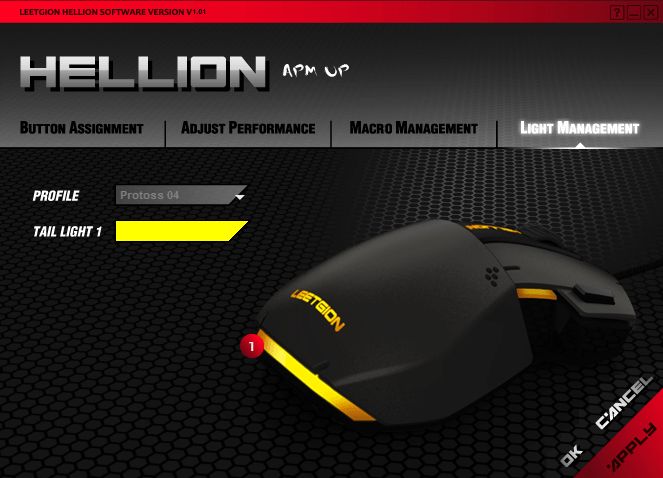 One aspect that I like was being able to change the profile physically on the mouse would change the profile that was selected in the Hellion Configurator. This gives an odd sense of connection between the physical object and the software. There were a few limitations I came across in the software light the lighting options as well as the way you add/edit addition macros. This mouse is very much for a specific type of player. As I mentioned before its the right tool for the job. If you're an RTS gamer who plays a lot then I would suggest that you put this on your list of serious candidates. If you're a casual RTS gamer its probably going to be a bit of a reach justifying it. I'm impressed with the innovation they have put into one mouse. The profile selector and Cherry MX Attack button are very well implemented and show a level of focus from their designer.